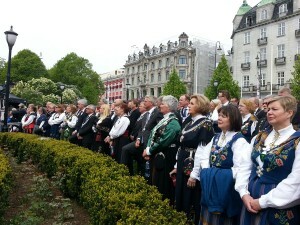 The common and widespread use of bunad in Norway makes this tradition unique in European context, and this use is also one of the reasons why the intangible knowledge in the making of the bunad survives. Manufacturing a bunad requires skills and knowledge of many techniques, and the Norwegian Folk Art and Craft Association is constantly working to safeguard this knowledge. 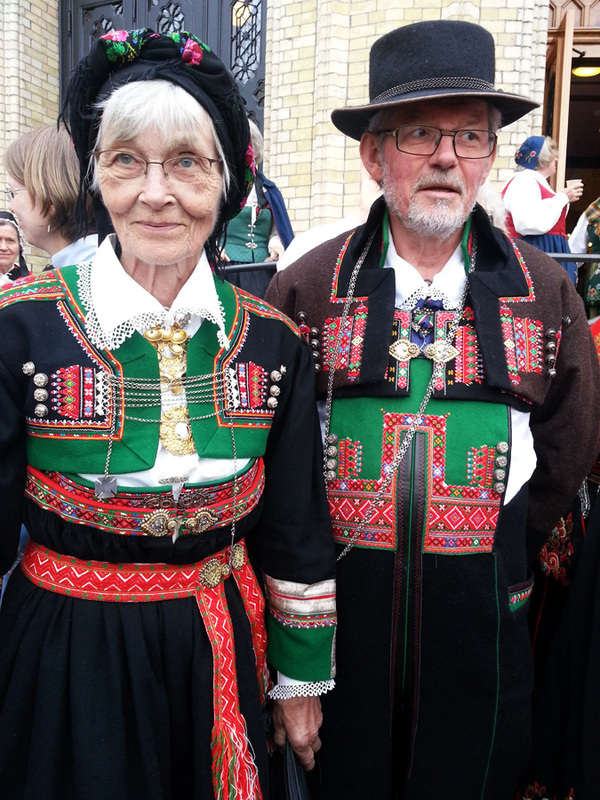 But there are voices that raise the question “Are we fighting against time?” The population in Norway is about 5 million people and there are approximately 450 different versions or models of folk dresses or bunad. 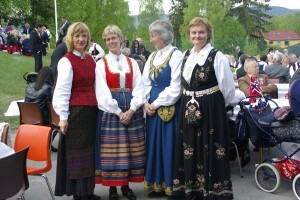 The National Institute of Bunad and Folk Costume defines the change from folk costume to bunad as following: The clothes worn by the rural farmer population in pre-industrial Norway are the folk costumes or folk dresses. These clothes were results of tradition, external influence, local creativity and individual taste and differed from the habits in urban areas. The common use of these dresses decreased around 1850s. At the same time the folk costume became an object of renewed interest by the urban elite. When the romantic nationalism made rural values a symbol of what was unique and special for Norway as a nation in the early 1900s, the interest for folk costumes increased.. It is at this stage the folk costume becomes a bunad. Throughout the first decades of the 1900s a considerable amount of different bunads were created, with more or less roots and inspiration from the old folk costumes. Today a bunad is the garment Norwegians wear for both weddings, christenings, important family events, the Constitution Day and even formal events. 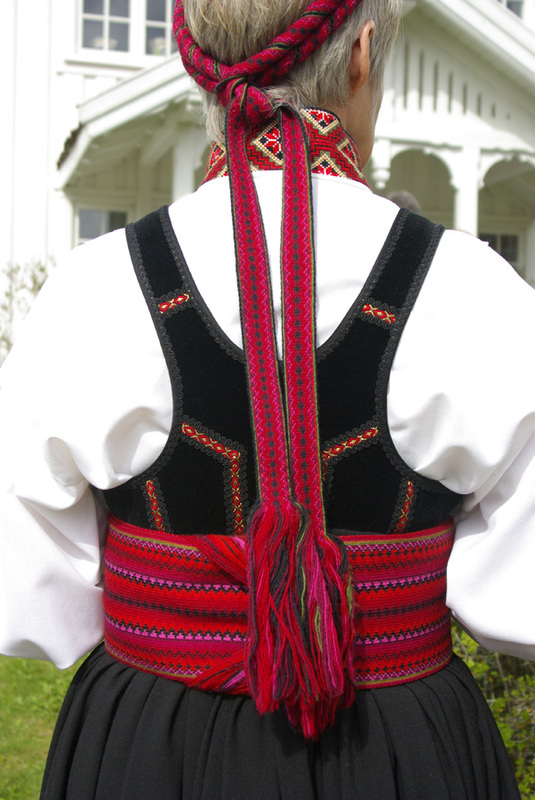 A bunad may also be worn when the dress code is gala. 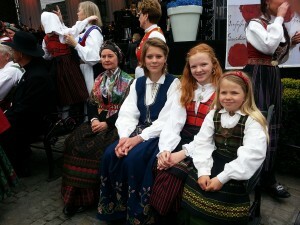 More than half the Norwegian population owns a bunad or a folk costume. The common use of bunad today, and especially how it is tied to ceremonial activities, makes the act of wearing a bunad a way of both maintaining, transmitting and continually changing the cultural knowledge Norwegians have in regards of the bunad. Wearing a bunad is only one side of the intangible knowledge of the bunad – the making ofit is another. Concentrating on the issue of wearing; many of the dresses have details which distinguish between unmarried girl/boy, married woman/man and even widow/widower. As a wearer of bunad you ought to know what is what, and what you actually are wearing. This kind of knowledge is decreasing rapidly in our modern society simply because your “individual status” is not of any public or general importance . 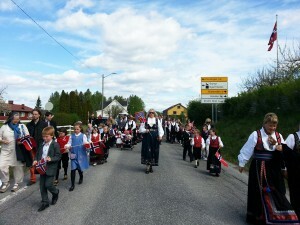 In order to ensure that the bunad traditions continues in future, there is a need for people who has the knowledge of both dressing up and producing – and can practice the great number of techniques required to make a bunad. There are at least 450 different Norwegian folk costumes. 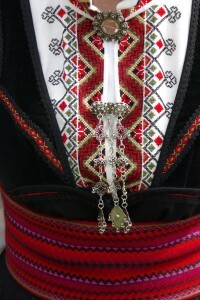 Each bunad consist of a number of separate parts made in a specific technique; it might be woven wool, linen, silk, knitting, embroidery, lace and ribbon making, crochet, gold and silver smithery, filigree, leather and more. In addition you have the jewelry, knifes, hats and shoes. Many of these items represent old and traditional technical skills that are strongly threatened by extinction. Take the example of metal bobbin lace, which is an important part of many bunads in western Norway. As of today, less than a handful of people have the knowledge and skill to do this in a Norwegian tradition. The importance of making sure that the intangible cultural heritage aspect within a technique like this cannot be stressed enough. Local communities which find an interest in maintaining their local traditions and practical knowledge. Luckily, each year over 1500 persons attend courses in bunad manufacturing with different husflidslag (local branches of Norwegian Folk Art and Craft Association), teaching and learning how to tailor, tablet weave, bead, do filigree and more. Norwegian Folk Art and Craft Association have about 370 local branches or communities geographically spread all over Norway. In 2013 there were 300 courses organized by 93 different communities where both member and non-members of Folk Art and Craft Association attended. There were such an offer in every of the 19 regions in Norway. The communities themselves decides when and in what subject they like to, or have instructor capacity to, start a course. This is the ongoing main action to safeguard the various skills and techniques. The instructors are local, the participants are local and the dresses are local. We see that local community owned training possibilities transmits shared values, knowledge and skills and both support and inspire for lifelong learning. A few communities do also have a very high level of consciousness when it comes to involving younger persons. They may for example make a special course invitation to girls aged 14/15 years together with their mothers in the semester before they will attend the confirmation ceremony in church. This is done to help them make a folk costume of their own. Today bunad has become the most common worn garment at this event. In addition to the sewing or tailoring courses you normally will find shorter courses in various specific techniques. If there is no local instructor available there might be one at least in the region. If not, Norwegian Folk Art and Craft Association may give advises on where to find one. The courses might be evening courses, weekend courses or courses of week long duration in holiday periods. But neither the teachers nor the students of these techniques are of the younger generation, of course there are exceptions, but the average high age of the instructors and local producers makes the knowledge very vulnerable. This system of non-formal means of transmitting knowledge is in our opinion a good example of “best practice” in safeguarding action and can be linked directly to the UNESCO Convention for Safeguarding of the Intangible Cultural Heritage. There are also communities within other NGOs in Norway who dedicate on voluntary basic almost a full time research in the history and reconstruction of folk dresses. In such cases the governmental supported Norwegian Institute of Bunad and Folk Costume (NBF) may act as an advisory body. Quite often this kind of local initiatives of research are of 5-10 years duration. Seminars and training for employees in Husfliden (specialized shops selling bunad) to give them a better understanding for the cultural dimension and values of the bunad. There is a national public vocational education system besides the non-formal learning activity. The reform of 1994 changed completely the structure of vocational education in Norway and since then the possibilities for training and apprenticeship within almost every of the small and traditional craft skills have been a major problem. Our system does not attract young students and there are huge problems to get a contract as apprentice. In a five years term there have been only about 5-7 young apprentices in bunad production, in addition to these about 10 -12 adults. This is a number far below the future need in the professional bunad manufacturing done in the 35 Husfliden craft shops or in small private enterprises. 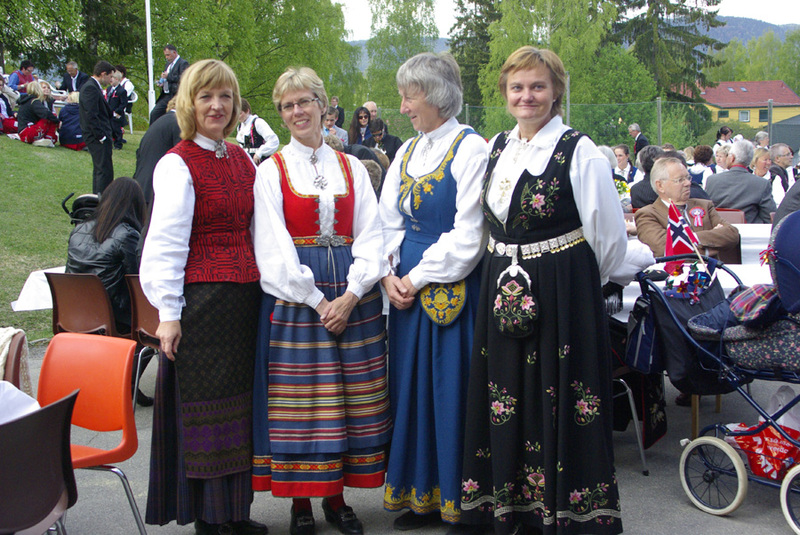 The Norwegian Institute of Bunad and Folk Costume (governmental), Norwegian Forum for Folk Dresses (NGO), Noregs Ungdomslag (Norwegian youth association)(NGO), Norwegian Folk Art and Craft association (NGO) and Association for Studies of Traditions (adult learning) have established a trade-specific network, and are continually working to develop methods for safeguarding knowledge of bunads and also trying to facilitate the bunad manufacturing as a way to make a living. Both among communities and individual members of relevant NGOs there is a quite strong awareness of the actual pressure on the bunad traditions. On one hand the majority wants a living tradition, on the other hand too many are not willing to except the real production costs for a bunad manufactured in Norway. They choose one produced outside its cultural area of origin or abroad. This is a real threat and emphasizes the need of information about production of bunads, and the need to strengthen the cultural understanding among people. In general the common understanding of what is required to achieve highly specialized skills in traditional craft are decreasing rapidly. This again has a strong influence on the attitude to quality, origin, time consumed for production etc. The professional producer, a master in its craft, suffers by this. A goal is to give the profession of bunad manufacturer higher status and professional acceptance. The endeavor to achieve this is part of the safeguarding actions done by the NGOs in the field and also by the Norwegian Institute of Bunad and Folk Costume (governmental). To safeguard the complexity of the living bunad traditions, to ensure that there will exist craftmen able and willing to make bunad in the future, and that bunad manufacturing can be a way of living in Norway, every action is important on its own and there is a constantly need for a awareness raising. There is a necessity of recognition of artisans and traditional tradition bearers and to ensure social and economic sustainability in production of bunad. But even much higher on the agenda in the years to follow will be safeguarding the most endangered techniques and ensure recruitment of instructors in the large number of highly specialized craft skills and techniques. i would like to embroider a Rogaland bunad for my granddaughter and have been painstakingly translating the directions from Norwegian to English. Are there English translated directions out there somewhere that i can get my hands on? I am trying to locate patterns, authentic fabric and trim to make a bunad for a Norwegian relative. Can you please tell me where to start? I don’t speak Norwegian, but I would like for the costume to be approved by the Norwegian Institute of Bunad and Folk Costume before starting on this adventure. Is anyone available to make me a full costume from some Norwegian region? I live in Canada and we are trying to maintain Scandinavian traditions here. I would like the embrodiery instructiions for a Skjeggedal – forkle Could you please refer me to where I can obtain and directions. I have the forkle and the thread. I am stuck on how to do some of the stiches.